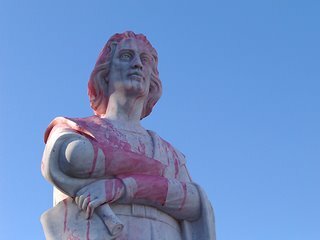 As of 3 o’clock this morning the statue of Christopher Columbus standing in the North End has been drenched with red paint. This stain is a symbolic action celebrating the collaborative efforts of the privileged and the oppressed in the fight for collective liberation. Previous examples (a very small sample) of such 'symbolism' here and here.